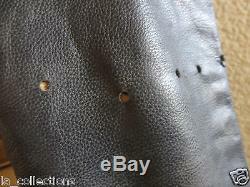 DISNEY'S PIRATES OF THE CARIBBEAN Tall Black Leather Boots Character name tag has come unglued & fallen off. 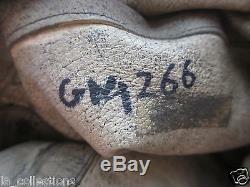 See pic of glue trace. Get A Piece of Pirate DISNEY History!!!!!! 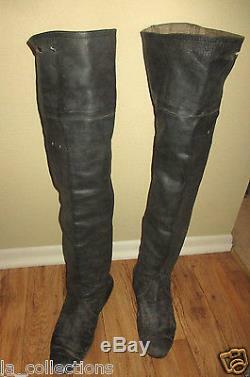 Production Used Black Leather tall boots. 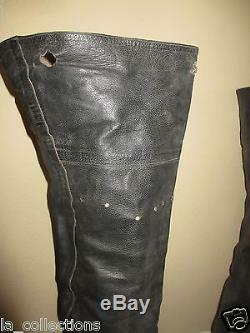 Each has identical holes in them most likely to hold them up or such especially if used for stunts. 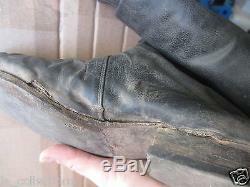 Looks like the boots hit water since the soles have evidence of such use (see pics) or they are just Production distressed to look worn and dirtied as pirates always are. 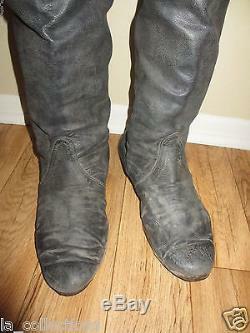 Could also be military soldier boots as well. 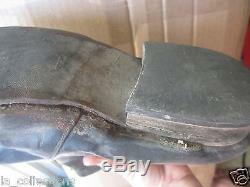 SIZE not indicated so I measured sole of boot. Its 11-1/2 inches heel to toe Came in a Pirate 1 costume box. Assuming from the first movie since in the same box I found Jack Sparrow's boots from the first film. Great for cosplay or display as a collectable. Super Cool to wear on Talk Like A Pirate Day. Authentic Disney Costume Department Wardrobe Piece Get the real deal. A piece of Disney History. Any wear is a natural part of the costume design or production use. Comes with LA Collections store COA to guarantee its authenticity. SEE ALL MY OTHER "SCREEN WORN" JEWELRY, BELTS, CLOTHING up for Sale in my "Other Items" link at the top of this page. Often but not always is the character name written inside of the clothing, or belt for identification by wardrobe department. Other times when the clothing may be removed by an actor in a scene the clothing is not marked inside the wardrobe in order to avoid it showing up on screen. It really depends on the designer for the production. Sometimes none of the wardrobe is labeled on the actual piece of clothing and they are labeled with a large paper tag when stored before given to the actor to wear for that day's filming. It is also customary for costume designers to write the character's name on the item instead of the actor's name unless it is an extra actor who does not have a character name in the script and then the extra actor's name is written on the item in case there are multiple days the actor needs to wear the same item. Also if there are several episodes the character is wearing the same outfit, many of the same pieces of clothing will be used i. 5 pairs of the same jeans or shirt. This is so the actor is wearing clean clothes or in case an accident happens that damages clothing there is a spare pair for them to wear. In the case of TRUE BLOOD, blood is often used in many scenes so several of the same clothing item are used. Some items used for non-bloody part of the scene and the same item worn for when blood come in contact with the actor. 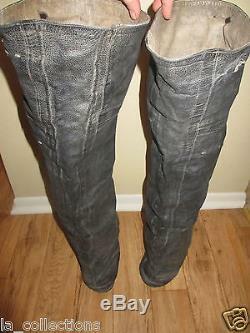 For one blood scene the actor may wear 2 to 6 pairs of the same jeans, so you may see multiple items listed when this is the case. Some of my items has minor fake blood stains. When that is the case, it will be listed in the item description. All Items from a Smoke-Free, Pet Free, Clean Store!!! PAYMENTS : Pay Pal only please. Pay quicker to receive your item quicker!!! Like any Retail Store or Sales these types of costs are passed onto the customer. I try to be as fair as possible. All items packed with care!! 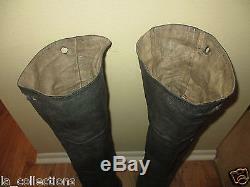 The item "PIRATES OF CARIBBEAN Black HIGH BOOTS Screen Used Production Worn Prop DISNEY" is in sale since Friday, September 21, 2018. This item is in the category "Entertainment Memorabilia\Movie Memorabilia\Wardrobe\Originals". 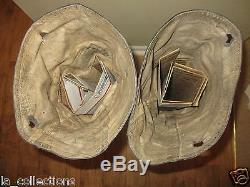 The seller is "la_collections" and is located in Los Angeles, California. This item can be shipped to United States, Canada, United Kingdom, Denmark, Romania, Slovakia, Bulgaria, Czech republic, Finland, Hungary, Latvia, Lithuania, Malta, Estonia, Australia, Greece, Portugal, Cyprus, Slovenia, Japan, China, Sweden, South Korea, Indonesia, Taiwan, South africa, Thailand, Belgium, France, Hong Kong, Ireland, Netherlands, Poland, Spain, Italy, Germany, Austria, Israel, Mexico, New Zealand, Philippines, Singapore, Switzerland, Norway, Saudi arabia, Ukraine, United arab emirates, Qatar, Kuwait, Bahrain, Croatia, Malaysia, Brazil, Chile, Colombia, Costa rica, Panama, Trinidad and tobago, Guatemala, Honduras, Jamaica, Antigua and barbuda, Aruba, Belize, Dominica, Grenada, Saint kitts and nevis, Saint lucia, Montserrat, Turks and caicos islands, Barbados, Bangladesh, Bermuda, Brunei darussalam, Bolivia, Ecuador, Egypt, French guiana, Guernsey, Gibraltar, Guadeloupe, Iceland, Jersey, Jordan, Cambodia, Cayman islands, Liechtenstein, Sri lanka, Luxembourg, Monaco, Macao, Martinique, Maldives, Nicaragua, Oman, Peru, Pakistan, Paraguay, Reunion.